When it’s time to upgrade the old and outdated countertops in your home, our store has you covered. If you wish to improve the value of your home, as well as enhance your interior design, investing in new countertops is an ideal solution. Improve the value and visual appeal of your home. Stylish countertops also provide a sturdy surface for you to prepare meals or provide ample space for use in your bathroom. On top of that, a new countertop hewn from stone imparts a stunning aesthetic effect. Create a warming atmosphere and impart an air of elegance throughout your home. Our store associates are more than happy to help you reach your design goals. Homeowners have been making the switch to marble, stone, and quartz countertops for their beauty, durability, and longevity. Whichever material you choose, these options share similar characteristics that make a home stand out. First and foremost, countertops that are hewn from stone, marble, and quartz are built to last. They are practical investments. These non-porous surfaces are polished and treated to a presentable shine. As a result, these countertops can resist spills and stains with ease. In addition, their stone construction ensures your investment withstands the test of time. Our stylish and durable countertops are also low-maintenance fixtures. Since they resist staining and scuffs, cleaning is a stress-free process. The most you will need are an appropriate cleaner and a rag. With proper care, the new look you get on the first day of installation will remain throughout the life of your investment. Of course, one of the most recognizable features of stone countertops is their stunning visual appeal. All of our countertops are available in a wide selection of colors, designs, and patterns. 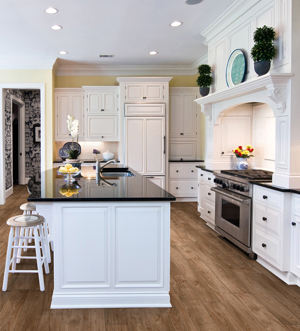 Coordinate with your cabinetry and flooring to create a look that is uniquely yours. These heavy-duty pieces add a layer of sophistication to your bathroom or kitchen. We offer a wide variety of kitchen and bathroom countertops. Our in-store design experts will assist you in determining the right countertop for your home. Once you find our favorite countertop, we work with you to ensure you get the proper measurements and materials for installation. Our countertop installation team is available to assist you after you make your purchase. 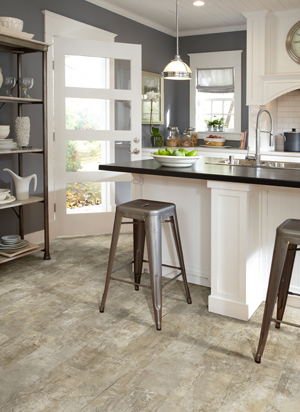 Stone is a naturally beautiful material that is extremely durable. We offer different types of stone countertops, allowing you to find the solution that fits seamlessly with your existing interior design. No two pieces of marble are alike, making it a unique addition to any space. Available in varying patterns and hues, there is no style or scheme that can’t be enhanced by one of the high-end marble countertops from our selection. You simply can’t go wrong by choosing to place classic granite countertops in the kitchen or bathroom. Their timeless appearance and guaranteed value make them a wise investment for even the choosiest of homeowners. It remains easy to clean, and is available in countless colors and finishes. Quartz is becoming an increasingly popular alternative to other, more costly countertop materials. Made from a combination of quartz, resins, polymers, and pigments, quartz countertops offer a granite-like appearance, along with proven durability. The controlled manufacturing process allows us to control the hue, pattern, and color of the surface. Have confidence knowing that you are investing in durable and beautiful countertops. Since we sell our products directly from our location, you are able to enjoy a wide selection of countertops while also staying well within your budget. We work with popular manufacturers and brands to ensure low overhead costs. The savings are practically passed on to you. Renovating your kitchen or bathroom should be an affordable and seamless experience. For this reason, our design specialists and countertop installers work together to deliver value you can see. From the showroom to your bathroom, our company always keeps your needs in mind. We strive to attain the results you want while paying careful attention to your budget. When you purchase countertops from our collections, we encourage you to take advantage of the countertop installation performed by on-staff experts. Our team has undergone extensive training to become familiar with the installation processes for the many products and materials we offer. Our installers make a point to utilize proven tools and techniques to complete jobs in a timely manner. Before we begin the installation process, we’ll even provide you with professional measurements and a project estimate. A proper countertop installation ensures your kitchen or bathroom remains neat, orderly, and beautiful. Work with a team that is committed to your absolute satisfaction. Our installers work according to your schedule, so you never have to worry about feeling rushed. We deliver your purchase directly to your location, and get right to work. Have total confidence in your investment. Since we are prepared with the proper tools and equipment, you can rest easy knowing that we are on the job. For us, our work is not complete until you are completely satisfied with your new countertops. Contact us today to learn more about our line of countertops. We proudly serve clients in Hooksett, New Hampshire.